So I made it home all good, I dont remember leaving the house such a mess but It was. So I ran in MSA for like 10-15min and my legs are worked, its a good thing I dont plan on doing any running any time soon. I also got some room mates Mike and Lina Holroyd these white water Kayakers, Lina is from germany, Ya das is gut, to bad about the football world cup. We hung a german flag out the front of the house but it didn't work. I went and paddled a boat on cultus lake. It was crazy, my arms kind of got sore but I will do it again for sure. 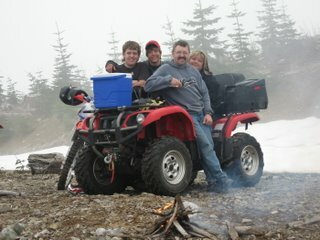 on the Sunday I went dirt biking/quading with my cousins up at chilliwack lake, the photo is my cousins and aunt and uncle and thats the Quad I drove, the thing is like a cadillac. I did a motor pace with marsh cooper driving the scooter, It is so much harder going behind a skinny Marsh wearing a Sugoi undershirt then it is going behind my dad wearing a snowmobile suit. I did a whole lot of chilling. it was good times, but I need to get a BBQ very soon there must be cooked meat. Next weekend is the Park city NORBA.